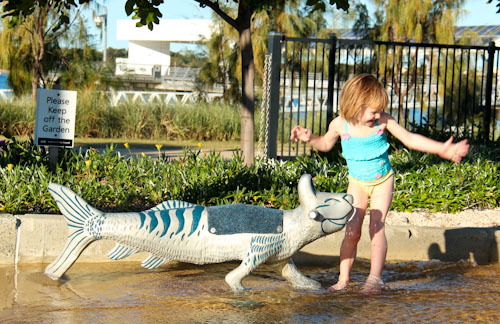 In Queensland, our winter fun means water play! 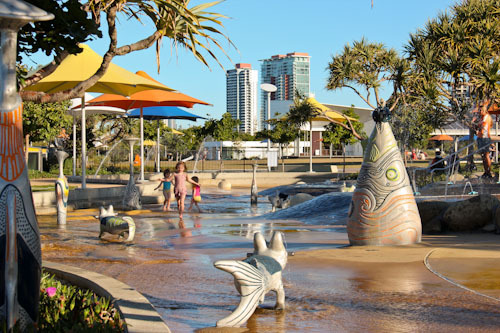 Today, a visit to the heart of the Gold Coast City meant we could play in a water playground at the Broadwater Parklands — a three-kilometre strip of recreational park alongside the stretch of the Nerang River known as the Broadwater. 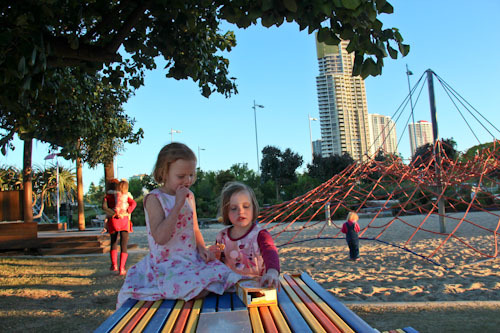 When we last visited the Broadwater Parklands (two years ago! 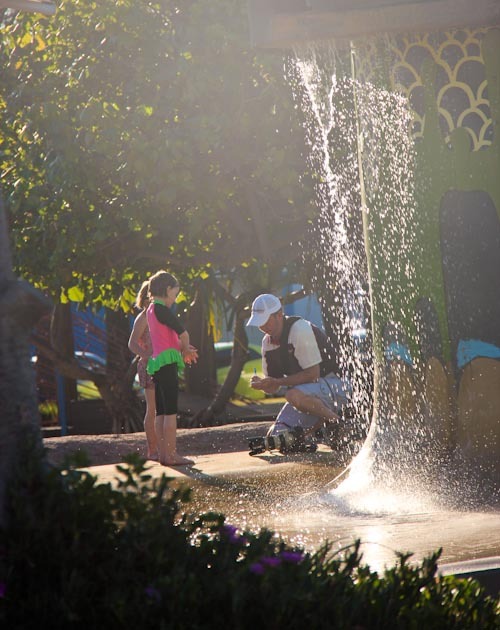 ), we noticed a water-park was under construction as part of a $50 million renovation of the whole parklands. 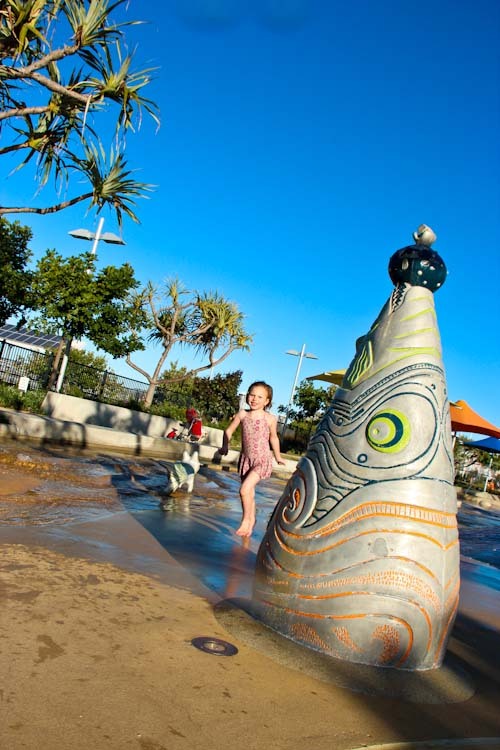 The Rockpools is a inviting place to play, and the artistry and design of the playground is really unique. 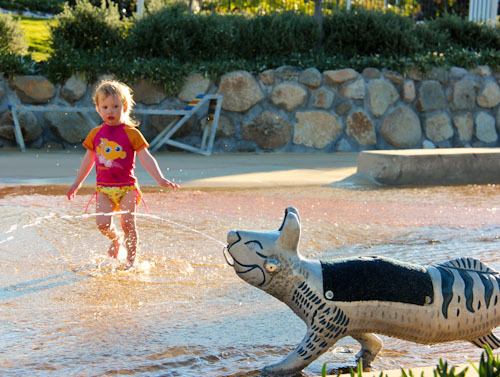 The water playground integrates whimsical sculptures with fountains. 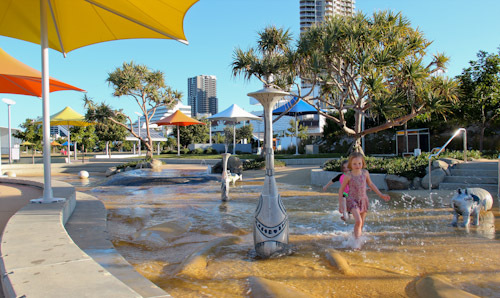 A seagrass sculpture attracts children to the top fountain area. The lifeguard on duty told me that it runs on a six-minute cycle. 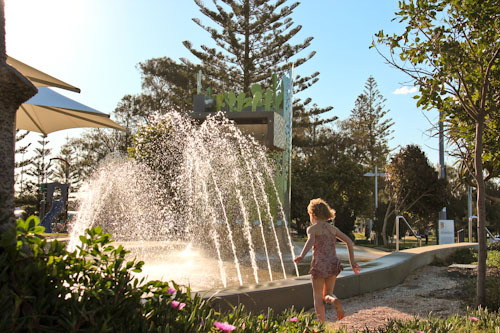 Sculpture is combined with natural water movements — the water surges and disappears, mimicking the tidal changes of the adjacent Broadwater. 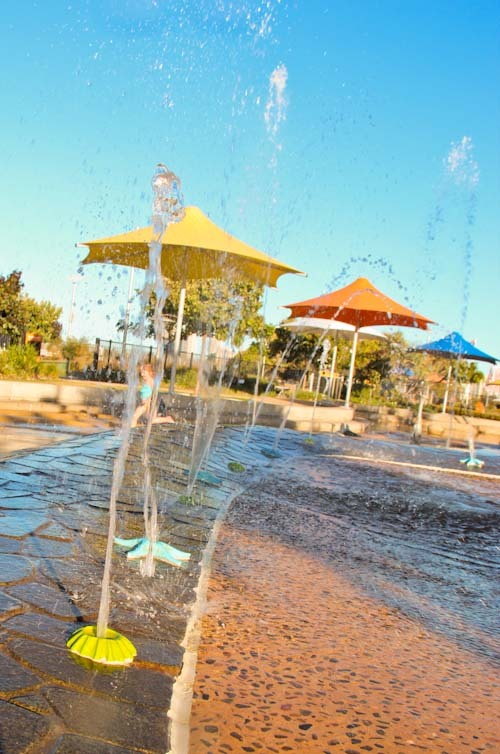 Umbrellas around the periphery of the shallow pools provide shade for watching parents. Calista gets licked by a cheerful catfish. The marine theme continues with the fine details. These starfish and anemones border a "tidal pool" which fills up and then empties. Delaney loves the water so much, she's always the first to go in and the last to come out! 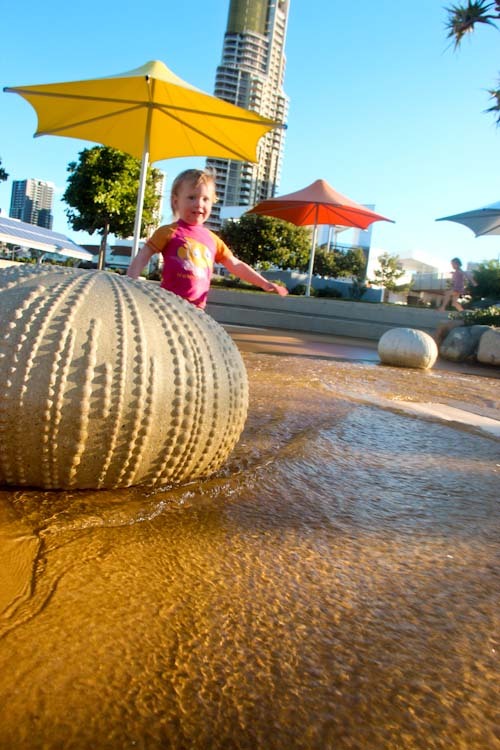 These large sea urchins provide handy jumping-off places for small children. 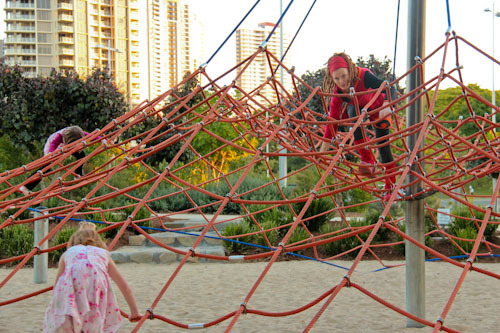 That's an essential feature of an excellent playground! Aisha and Brioni like to race along the course of the waterway (and the lifeguard cautions us against running). With some of the fountains on a timer, it's never obvious where the water will suddenly be coming from! Our girls’ antics caught the eye of a roving photographer looking for something to brighten up his newspaper. David asked permission to take pictures, and then had to coax the girls to a certain area so he could get the shot he wanted. After David takes the girls' photos for the local paper, they spell out their names for him. Close by, the toilets are located in an arty sort of building which also houses a café. There are also showers available, something that makes this place all the more appealing to this nomadic traveller! 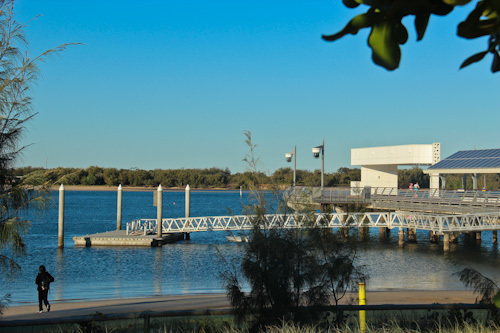 A jetty stretches out into the Broadwater, providing a nice place for a quiet stroll or a good place to fish. When the girls got too cold, it was great to be able to return to our bus and change back into dry clothes. I was also thankful that we still had some crackers on board to combat the hunger pangs before they became too fierce! 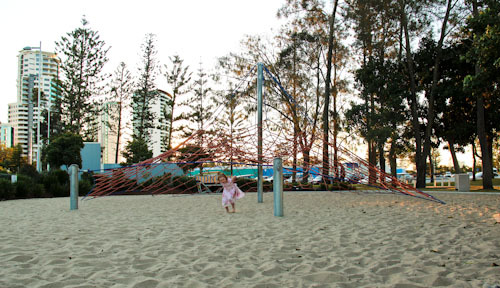 A dryer sort of playground is adjacent to the Rockpools at the Broadwater Parklands. Although it isn’t anything spectacular, our girls enjoyed climbing on the equipment and even coaxed me to join them in play. Brioni surfs the middle of the very modern, almost-boring alternative to the traditional see-saw. 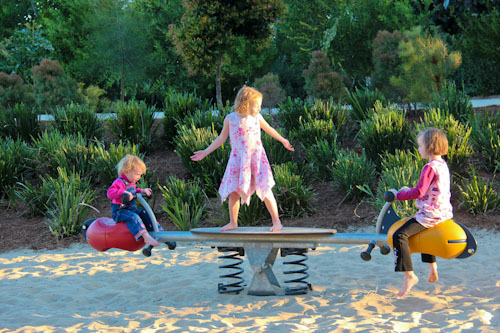 You can't catapult your sister off one of these! 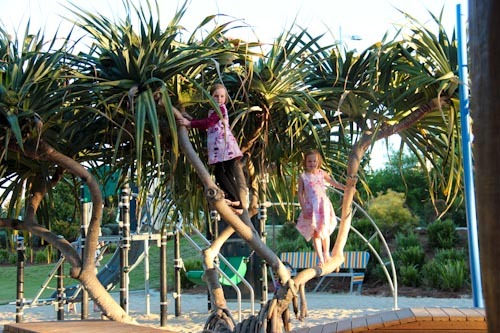 A pandanus tree entices our girls before they start climbing on the metal structure behind it. The girls fuel up on some crackers, and I take Calista to the equipment on my back. 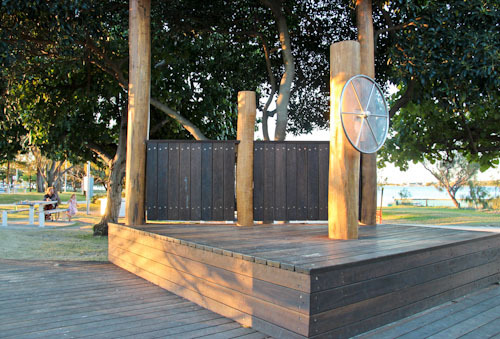 A series of timber platforms mimics a ship, but it remains neglected except as a seat for watching parents. Calista tries out the twisted climbing ladder. Brioni has started a new series of tricks that involves twisting around in the air after hanging from high structures by her knees. Thankfully, she manages to land on her feet most of the time! Without David around to engage the girls, and as I no longer have a baby in my arms, I've started playing more. It's good for all of us. 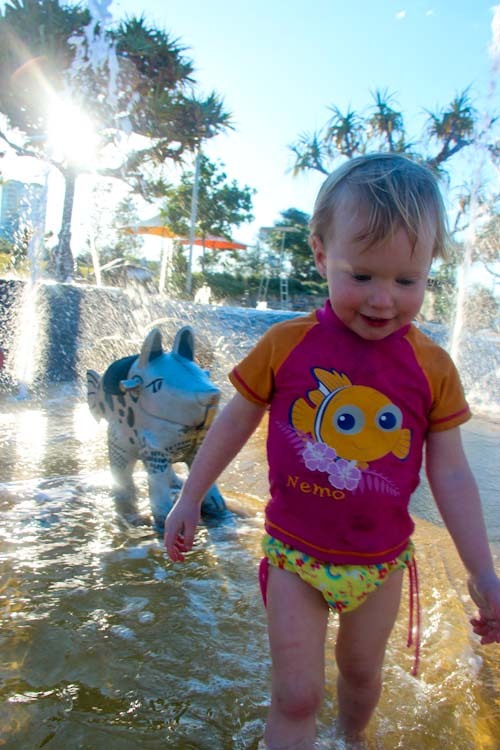 The Rockpools is like a wonderful mix of two of our favourite Sydney playgrounds — Redfern Park with its artistic constructions and Tumbalong Park with its water features. 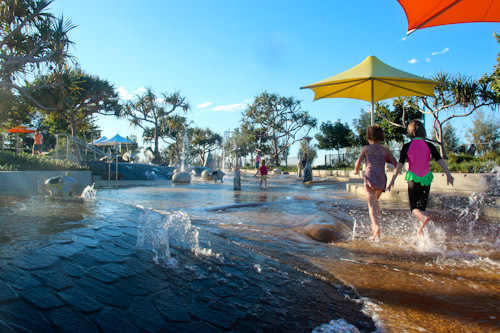 Family friendly, shady options, toilets close by, lots of parking and even a more traditional playground on its outskirts — the Rockpools will be a favourite stop of ours whenever we’re in the area! Love your pics, I have itchy feet to get on the road again now!! I love how traveliing with children can be so full of joy not the drudgery that many parents complain about it being. You’re amazing and inspiring thanks for continuing to share. Beautiful… Your girls are so lucky to be your daughters. You’re the best, Lauren! Reilly loves that Fish/Pig water statue. I have so many pics of him and that thing!!! In a hurry, so i only looked at the pictures on this post. The smiles and sense of security on your girls faces shows me that you have given them a solid foundation in these difficult times. There is no better gift you can give them right now, and I applaud you! This will go with them, and through it they will learn that they can likewise depend on God to be their foundation when everything else crumbles. 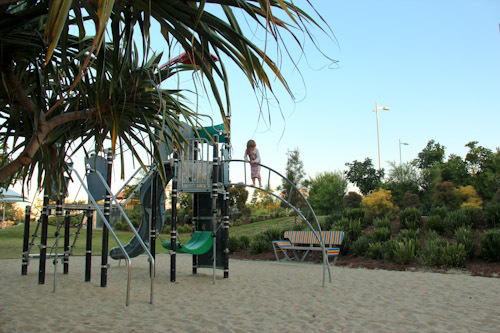 What a fantastic playground! It reminds me of ‘Muddys’ up in Cairns. A very similar free water playground next to the ocean. We have spent a bit of time there when visiting family. PS. 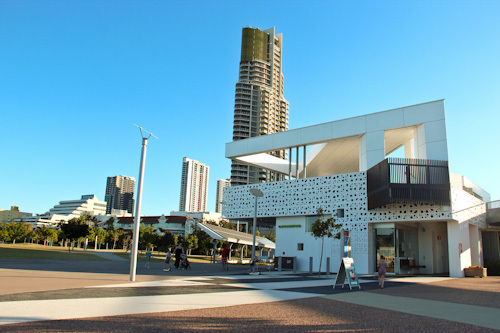 if you ever do go up to Cairns please let me know as I will have some free accommodation for you.